4 Gloucester is located on the west side of Gloucester, between Beacon and Marlborough, with 401 Beacon to the north, across Alley 415, and 6 Gloucester to the south. 4 Gloucester was built ca. 1871, one of three contiguous houses (4-6-8 Gloucester) built for investment banker Henry Chapman Wainwright for speculative sale. Henry C. Wainwright purchased the land for 4-6-8 Gloucester on May 23, 1871, from George Williams Pratt, an investment banker and stockbroker and one of the founders of the Boston Stock Exchange. He and his wife, Mary Barrow (White) Pratt, lived at 13 Louisburg Square. They also maintained a home, Oakley, on Belmont Avenue in Watertown (it became the Oakley Country Club in 1898). The land for 4-6-8 Gloucester originally was part of a larger parcel purchased from the Boston Water Power Company on February 20, 1863, by George Pratt’s son, Robert Marion Pratt, also a banker and broker. Click here for an index to the deeds for 4 Gloucester. 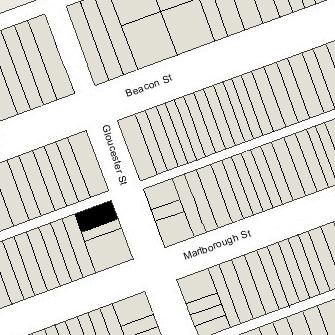 When he sold the completed houses, Henry C. Wainwright included in the deeds a four foot wide easement across the rear of 4-6 Gloucester to provide access to the alley for 4-6 Gloucester and drainage to the alley for 4-6-8 Gloucester. On April 21, 1873, 4 Gloucester was purchased from Henry C. Wainwright by Georgia Louise (Houghton) Smith, the wife of woolens dealer Josiah Granville Smith. Her brother, George W. Houghton, a clerk with J. Granville Smith’s company, lived with them. They all previously had lived in Jamaica Plain. Georgia Smith and George Houghton’s mother, Louise (Cleveland) Houghton, the widow of George Washington Houghton, also had lived with them in Jamaica Plan and probably joined them at 4 Gloucester. The Smiths continued to live at 4 Gloucester until about 1875, when they and Mrs. Houghton moved to New York City. George Houghton probably moved with them, but by 1880 he was living in Tombstone, Arizona, working as a miner. 4 Gloucester was not listed in the 1876 Blue Book. On May 19, 1876, 4 Gloucester was purchased from Georgia Smith by John A. Dove of Andover. He was the founder of the Smith and Dove Manufacturing Company, which built the first flax mill in the United States. He also owned 8 Gloucester, which he had purchased in June of 1872 and was the home of his son-in-law and daughter, John Adams Blanchard, Jr., and Laura Smith (Dove) Blanchard. John Dove died in November of 1876. During the 1876-1877 winter season, 4 Gloucester was the home of James Horswell, a woolen merchant, and his wife, Mary U. (Starkweather) Horswell. They previously had lived at the Commonwealth Hotel at 1697 Washington. 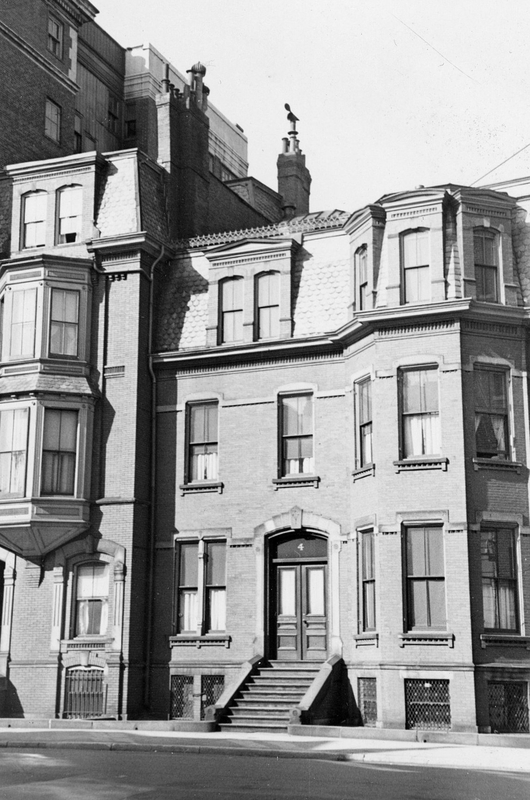 By the 1877-1878 season, they had moved to the Hotel Cluny at 543 Boylston. By the 1877-1878 winter season, 4 Gloucester had become the home of John Dove’s son-in-law and daughter, attorney William Phillips Walley and Clara Lyell (Dove) Walley. They had married in June of 1876. 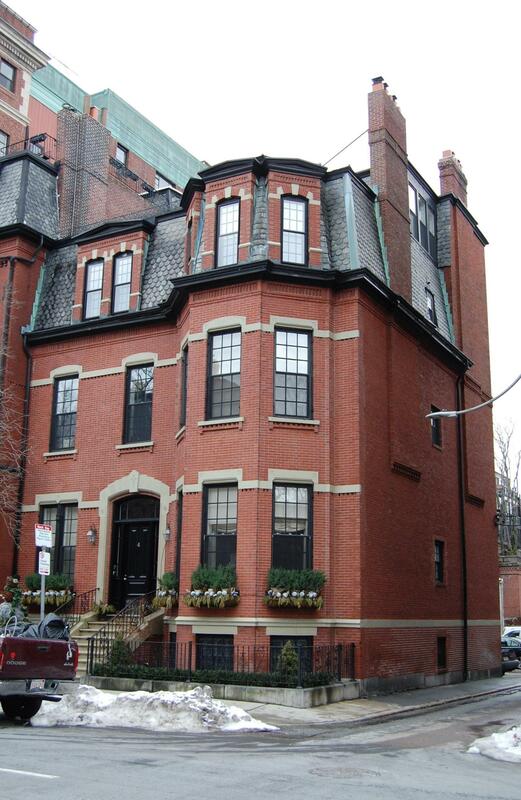 Prior to their marriage, he had lived at 69 Newbury with his father and step-mother, Samuel Hurd Walley and Ann Gray (Hawes) Walley, and he and Clara Walley may have lived there briefly after their marriage. 4 Gloucester had been inherited by Clara Walley and her five siblings: George William Webster Dove; Isabella Dove; Helen C. Dove; Mary A. (Dove) Johnson, the wife of Francis Howe Johnson; and Laura Smith (Dove) Blanchard, the wife of John Adams Blanchard, Jr., who lived at 8 Gloucester. On December 10, 1879, Clara Walley acquired 4 Gloucester from her siblings. William Walley died in November of 1891. Clara Walley and their daughter, Helen Bates Walley, continued to live at 4 Gloucester. During the 1896-1897 and 1897-1898 winter seasons, Mrs. Walley and her daughter were traveling in Europe and 4 Gloucester was the home of Richard Dudley Sears and his wife Eleanor Mary (Cochrane) Sears. They had lived at 86 Marlborough during the 1894-1895 season. Richard Dudley Sears was a real estate trustee. In 1881, he had been the first American men’s singles champion in lawn tennis, and was the winner of that title for each of the six following years. By the 1898-1899 winter season Richard and Eleanor Sears had moved to 257 Commonwealth, and 4 Gloucester was once again the home of Clara Walley and Helen Walley. Clara Walley died in December of 1900. Helen Walley was living elsewhere during the 1901-1902 and 1902-1903 winter seasons, and 4 Gloucester was the home of Philip Shelton Sears and his wife, Mary Cabot (Higginson) Sears. They previously had lived at 471 Beacon. Philip Sears was a lawyer and trustee, and later would become a noted sculptor. He was the brother of Richard Dudley Sears, who had lived at 4 Gloucester in the late 1890s. Philip and Mary Sears moved to 320 Commonwealth by the 1903-1904 season. During the 1903-1904 winter season, 4 Gloucester was once again the home of Helen Walley. She married in June of 1904 to Archibald Harrison, a banker from New York City. During the 1904-1905 winter season, 4 Gloucester was the home of investment banker Henry DeFord and his wife, Alice (Fessenden) DeFord. Their primary residence was in Brookline. On August 1, 1905, 4 Gloucester was purchased from Clara Walley’s estate by Joseph Smith Sylvester, a manufacturer of tack. He and his wife, Mary Ainsworth (Lyman) Sylvester, made it their home. They previously had lived at The Imperial at 308-310 Commonwealth. They also maintained a home in Hanover Four Corners, which they built opposite the estate of his father, Edmund Quincy Sylvester. Mary Sylvester’s parents, Dr. Charles Parker Lyman and Lucy Ellen (Pope) Lyman, lived with them at 4 Gloucester from about 1906 through about 1908. On March 24, 1915, the house was damaged by fire. At the time of the fire, Joseph and Mary Sylvester were in New York, and Joseph Sylvester’s mother, Eliza Smith (Salmond) Sylvester, was living at the house. The Sylvesters repaired the fire damage and continued to live at 4 Gloucester. The repairs and remodeling (which included a rear fire escape) were designed by Joseph Sylvester’s brother, architect Edmund Quincy Sylvester. They were living elsewhere from about 1923 to 1925, and 4 Gloucester was not listed in the 1923 and 1924 Blue Books. During the 1924-1925 winter season, it was the home of Ellen Louisa (Frost) Meacham, the widow of architect George Frederick Meacham. Living with Mrs. Meacham were Willard Gilman Brackett, a retired shoe manufacturer, and his wife, Fanny Elizabeth (Breck) Brackett. They all previously had lived at 174 Commonwealth. They had moved to 236 Marlborough by the next season. By the 1925-1925 winter season, the Sylvesters were once living at 4 Gloucester. Joseph Sylvester died in May of 1928. Mary Sylvester continued to live at 4 Gloucester with their daughter, Lucy Lyman Sylvester. Lucy Sylvester married in February of 1935 to William F. Fitzgerald, Jr., an author. After their marriage, they lived in Cambridge. On February 5, 1941, Mary Sylvester transferred 4 Gloucester into Lucy Fitzgerald’s name. Mary Sylvester continued to live at 4 Gloucester until her death in May of 1945. On November 9, 1945, 4 Gloucester was purchased from Lucy Fitzgerald by Richard William Langenbach and Hans Rudolph (Rudolf) Giger, partners doing business as the Longwood Engineering Company. In October of 1945, they applied for (and subsequently received) permission to convert the property from a single-family dwelling into four apartments. Richard Langenbach’s mother, Agnesse (Read) Langenbach, the widow of Raymond T. Langenbach, lived in one of the apartments. She previously had lived in Brookline. On June 21, 1949, she acquired 4 Gloucester from her son and H. Rudolph Giger. Later that year, she married to Ledru Joshua Brackett, president of Dorothy Muriel’s, a division of Brigham’s Inc., candy and ice cream manufacturers. After their marriage, they lived in an apartment at 4 Gloucester. He previously had lived in Jamaica Plain. The Bracketts continued to live at 4 Gloucester until the mid-1960s. On October 13, 1964, 4 Gloucester was acquired from Agnesse Brackett by Dorothy M. Newhook, and on October 30. 1964, she transferred the property to herself and Sylvia L. Norris. In October of 1964, Dorothy Newhook applied for permission to increase the number of units from four to five. She subsequently abandoned the application, probably because the property was sold soon thereafter. On May 30, 1965, 4 Gloucester was acquired from Dorothy M. Newhook and Sylvia L. Norris by Jack Eadie Molesworth, a philatelic dealer specializing in Confederate stamps. A leader of the ultra-conservative Young Americans for Freedom and a Republican State Committee member, he was an unsuccessful candidate for Congress in 1964. He and his wife, Phyllis (Carpinteri) Molesworth, lived in an apartment at 88 Beacon. The same month as he purchased 4 Gloucester, he filed for (and subsequently received) permission to increase the number of units from four to five. In July of 1965, he filed for (and subsequently received) permission to further increase the number of apartments to six. On March 3, 1978, 4 Gloucester was purchased from Jack Molesworth by Joyce B. Wilkinson. On September 13, 1979, she transferred the property to herself and her husband, Vladimir K. Petkovic. 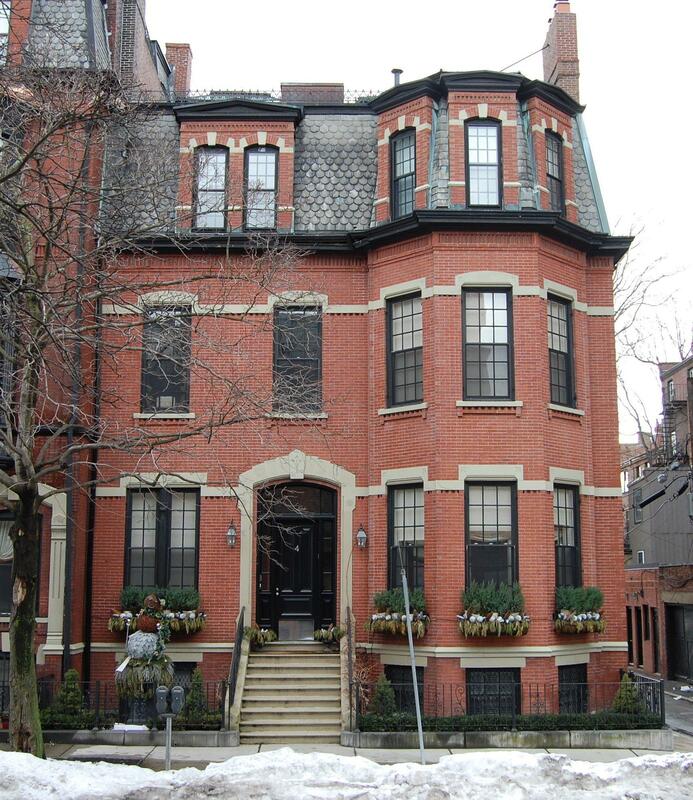 On December 30, 1996, they converted the property into three condominium units, the Four Gloucester Street Condominium. The legal occupancy remained six units. By 2002, all three units were owned by Edward Charles Gordon and his wife, Allison Beth Burman. In December of 2002 they filed for (and subsequently received) permission to reduce the number of units from six to four. In March of 2004, they filed for (and subsequently received) permission to reduce the number of units at from four to two. From 2006, 4 Gloucester was assessed as a single-family dwelling. It remained assessed as such in 2017.